affinity with dance, shiatsu and pilates, into a suitably powerful collection of tinctures and tonics that will restore radiance to your complexion. Potent, natural ingredients from dragon’s blood to ricesilk, and cutting-edge cosmetic science strike the perfect balance in the Su-Man skincare range. 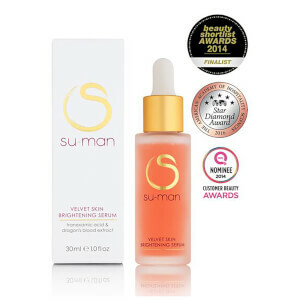 Su-Man’s magic hands bring luminosity to celebrity faces such as Juliette Binoche and Freida Pinto, as well as a host of beauty editors, with facials that have previously been described as the “non-invasive alternative to Botox”. Now the London-based therapist has bottled her facials into a namesake skincare collection that we like to think of as pilates for your face. If you only try one thing from this range, choose Su-Man’s Essential Discovery Collection. Based on the principles of holistic skincare, this trio comprises the Purifying Cleansing Gel, Exfoliating Facial Polsh and Velvet Skin Brightening Serum – a regimen for everlasting luminosity. 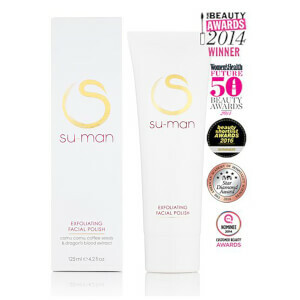 Discover Su-Man’s signature at SkinStore, and the secrets to ageless beauty.